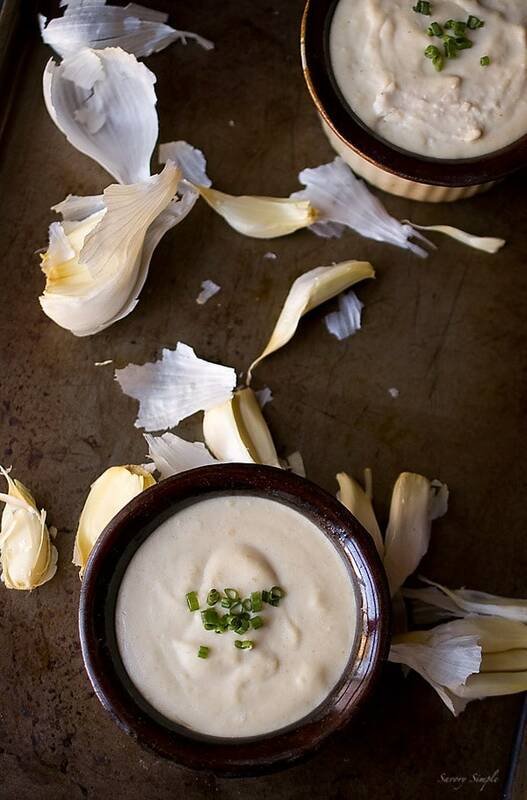 This roasted garlic white bean hummus is vegan, gluten free and full of flavor! For years I thought I disliked hummus. I found it boring and often bland with a flavor that did absolutely nothing for me. The problem? I wasn’t making it myself. When I finally tasted homemade hummus I was sold instantly. I’m sure there will be many who disagree with me but I have yet to find a store bought version that tastes good to me. Trust me, I’ve tried all the brands that people seem to go crazy for. Blech. Homemade hummus is one of the easiest things to make. There is no good reason not to make it from scratch! Beans. Garlic. Tahini. Lemon Juice. Olive oil. Salt and pepper. You might already have all of these items in your kitchen and if not, they’re cheap and easy to find at the local grocery store. I can pretty much guarantee that making it from scratch is cheaper than buying it pre-made. You basically put everything in a food processor, puree the hell out of it and it’s done. There is no excuse! You can even make it in a blender if you don’t have a food processor. If you think you don’t like hummus, give this a try. I wasted years of precious hummus eating time. Life is short! For this recipe I’m using white beans instead of the standard garbanzos. Honestly I almost always use white beans now because I love the smooth texture. You can make smooth chickpea hummus by peeling the skins off each individual bean but I tried that once and nope. Not doing it again. White bean hummus is all I need. 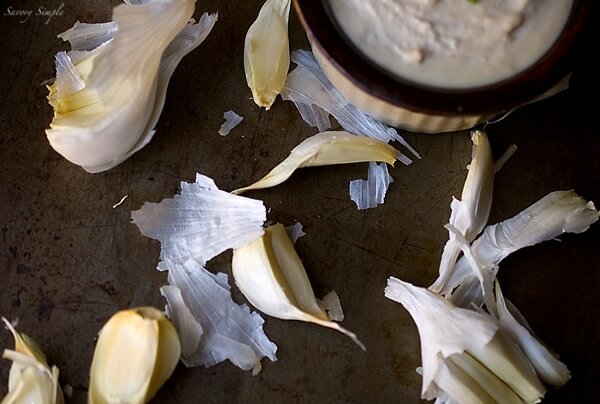 Most hummus recipes have one or two cloves of raw garlic but I prefer roasted garlic when I have the time. It’s milder and slightly sweeter. You can use a lot more of it. The last time I made this hummus I believe I used the entire head of garlic. Warning: roasting takes away much of the bite but you might not be kissable for a few hours if you use too much. I recommend roasting the entire head and adding 1 tablespoon at a time until you’re happy with the flavor. Or do as I did and make sure to feed a whole lot of it to your significant other while enjoying it. Preheat the oven to 400 degrees F. Slice off the top of the garlic head so that a small amount of each clove shows through. 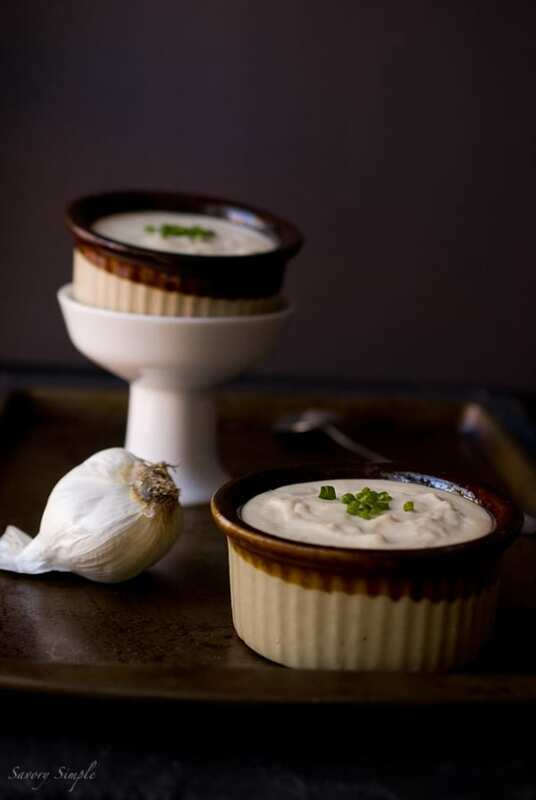 Place the garlic in a small ramekin and drizzle 1 tablespoon of olive oil on top. Sprinkle with a bit of salt. Cover the ramekin with foil and roast the garlic for 30 minutes. Set aside to cool. Once the head is cool enough to handle, squeeze the roasted garlic cloves into a small bowl and smash with a spoon to make a paste. In a food processor, puree the beans, tahini, olive oil, lemon and water. Season with salt and pepper to taste. Add 1 tablespoon or more of the garlic puree and process until smooth. You can use as much or as little of the garlic as you prefer. Roasted garlic is much milder than regular garlic but can still pack a punch! I recommend adding 1 tablespoon at a time until the desired flavor is reached. Yum, your hummus looks so good! I have to admit I’ve never made hummus myself, but I think I’m going to have to give it a go now! I make a similar version of this but not with roasted garlic, it sounds delicious!! My secret ingredient in my homemade hummus is Tabasco sauce. A couple of dashes totally changes the flavor! My friends had the same issue–didn’t like hummus, until they tried mine. And they LOVE it! Love the use of white beans in this! I just discovered the joys of using white beans in dips – it’s amazing! I can’t believe how much I’ve been missing out all these years. Aren’t white beans great? 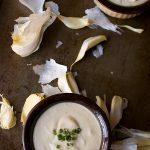 I’ve used them for creamy soups a few time as well. Peeling an acorn squash is bad enough, Jen, I can’t fathom peeling chick peas. Oy! This hummus looks delicious–I loved a white bean and rosemary dip at Whole Foods many years ago, and I bet the addition of a bit of rosemary would make a similar taste that I’m remembering. Thank you for the link love and for planting the seed for my hummus craving! this recipe sounds amazing! I love hummus, but I’ve only ever made it with chickpeas I’m going to have to grab some white beans! Made this this afternoon. So much better than any store bought! I cut the Olive oil down to two Tablespoons. The white beans give the hummus a very nice texture different from chickpeas, creamier. I love garlic anything so I knew I had to make this! Finally got around to trying this. We loved it. Nice break from “normal” hummus. Great recipe! Coincidence, I just made this today with Cannelini Beans because I was out of Garbanzos. It is delicious, but I like the idea of roasting the garlic as I love the mild nutty taste of roasted garlic. By the way, when I make Hummus with Garbanzos, I always peel them first. I know it sounds intensive, not to mention compulsive, but it makes a significant difference in the consistency and it only takes 15 minutes to peel enough beans for hummus. Another thing, I have been buying dried beans and cooking them because of the health risks from using canned products. Not weird at all! I used to peel the chickpeas. Now I just use white beans all the time. I’m lazy! Cannelloni is a pasta. I think that you meant Cannellini. I can’t believe no one has caught the error. Thanks for the recipe!